Contextualized by its unique sensor design and high-resolution electronic viewfinder, the Fujifilm X-T1 Mirrorless Digital Camera is an advanced camera poised for both action and multimedia shooters. Featuring a 16.3MP APS-C-sized X-Trans CMOS II sensor and an EXR Processor II, this camera can record up to 8 fps, as well as full HD movies, with an expandable sensitivity range from ISO 100-51200. Fujifilm's proprietary X-Trans sensor uses a unique randomized pixel array in order to avoid the use of a resolution-reducing optical low-pass filter, therefore providing images with the utmost sharpness and clarity. Furthermore, the X-T1 is designed within a weather-resistant magnesium alloy body that houses a 0.77x-magnification Real Time Viewfinder, tilting LCD, and a manual, dial-based control scheme. 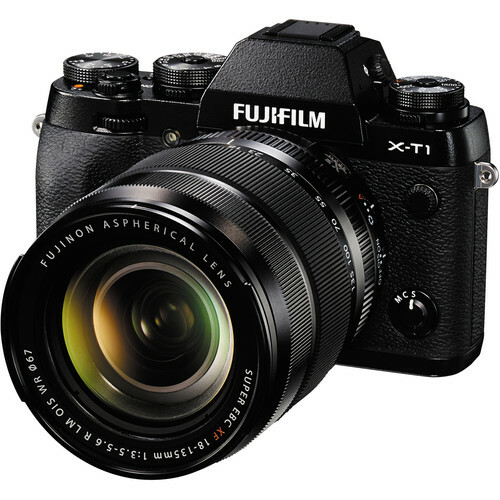 Complementing the tried and true Fujifilm technologies, the X-T1 features an enhanced handling system that enables its use in a wide variety of shooting situations. Included with the X-T1 is the XF 18-135mm f/3.5-5.6 R LM OIS WR lens; a wide-to-tele zoom providing a 35mm-equivalent focal length range of 27-206mm, covering wide-angle to telephoto perspectives. This lens integrates an advanced five-stop equivalent optical image stabilization to minimize the appearance of camera shake to benefit working with longer shutter speeds or greater focal lengths and a linear motor-drive AF system provides fast, smooth focusing capabilities. Its optical design includes four aspherical elements and two extra-low dispersion elements to minimize chromatic aberrations and an HT-EBC coating has also been applied to reduce surface reflections and offer greater image clarity. Additionally, this lens features 20 seals about its design to render it weather-resistant for use in inclement shooting conditions. The included XF 18-135mm f/3.5-5.6 R LM OIS WR lens provides a 35mm-equivalent focal length range of 27-206mm, covering wide-angle to telephoto perspectives to suit working in most shooting conditions. Its optical system is made up of 16 elements in 12 groups, which includes four aspherical elements and two extra-low dispersion glass elements to minimize chromatic aberrations and distortions throughout the zoom range. An HT-EBC multi-layer coating has also been applied to lens elements to suppress lens flare and ghosting to realize contrast-rich, color-neutral imagery. An advanced optical image stabilization system compensates for up to five stops of camera shake to better enable the use of slower shutter speeds and longer focal lengths. Additionally, a linear AF motor an inner focusing mechanism are utilized to provide fast, responsive focusing performance that is also smooth and nearly silent. This lens is also characterized by its weather-resistant design, which utilizes 20 distinct seals and an internal ventilator for smooth handling and protection from dust and moisture.